Michael Self won his third NASCAR K&N Pro Series West race in a row, but it didn't come without controversy. Self made a pass for the lead, going three-wide with Cameron Hayley and Greg Pursley, with two laps to go at Lebanon I-44 Speedway in Missouri. Hayley and Pursley were forced up the race track and spun out. The crash set up a green-white-checkered flag finish and knocked Hayley and Pursley, who combined to lead 147 laps of the Toyota/G-Oil 150, out of contention. Self pulled away from Daryl Hall and Dylan Lupton to win the race. Hayley wound up in seventh place. Pursley crossed the finish line in ninth place. "It's tight. It's short-track racing. You get into each other, you beat and bang," Self said. "I got taken out there with about 25 to go and we had to overcome it. It's how short track racing goes." Self's three-race winning streak is the first since Pursley won three races in a row in 2011. Self has won races at Brainerd International Raceway in Minnesota, a road course, Iowa Speedway and Lebanon I-44 Speedway, a 3/8-mile short track. "Three in a row, can't complain with that," Self said. "Road course, speedway and a short track, it's pretty unbelievable for us. First time out here to I-44 Speedway, and it couldn't have been a more eventful one, I don't think." It was the sixth victory in the past 15 races for Self. 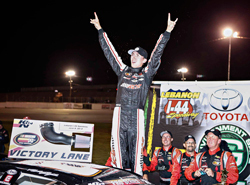 The race was second in three days for the K&N Pro Series West drivers and teams. Self became the first driver since Harry Jefferson to win West Series races on the same weekend since 1979. 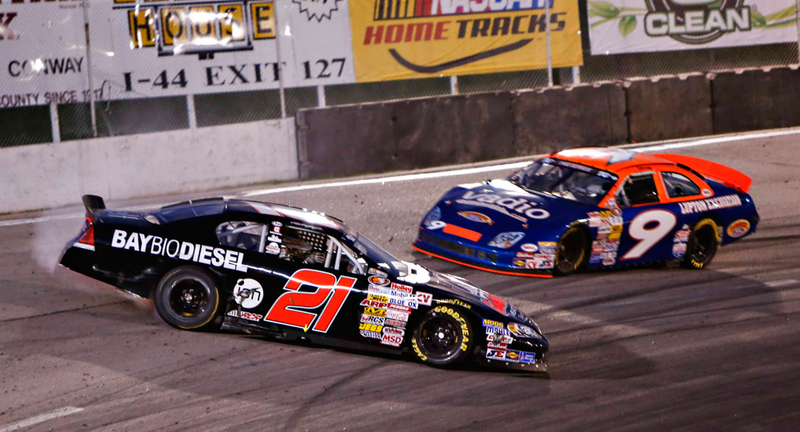 Michael Self spins during NASCAR K&N Pro Series West race with Dylan Lupton right behind him. Hayley won the pole and led the first lap of the race. Pursley, who started on the front row with Hayley, took over the lead on lap 2 and held it for 14 laps. Hayley and Pursley swapped the lead six times before the three-wide pass by Self on lap 147. Self won the race after a restart on lap 151 staying out front for the entire green-white-checkered flag finish. "When you're doing a restart with five to go, you go for it, you give everything you can and you take every single inch," Self said. "Any guy out there is going to do the same thing. Anyone who's going to be in a position to get taken out is going to be mad and anyone who's going to be in the winning position is going to be happy." 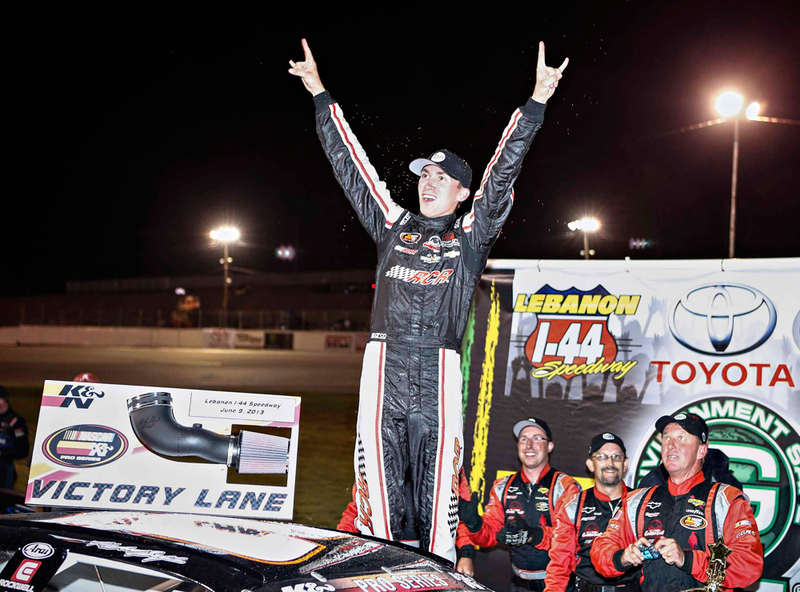 Harr, who competed and finished 24th in the NASCAR Nationwide race at Iowa Speedway earlier in the day, finished in the top five for the second time in five K&N Pro Series West Series races this season. "I'll take it. After 10 years, I'll take a second place," Harr said. "My dad Carl has been a big part of my life and my racing. Just to get on the podium in the West Series is so cool. He's going to enjoy this night as much as I am for sure." Lupton, a rookie, posted his second top-five finish of the season. "It was a great night," Lupton said. "The car was set up absolutely perfect. I just blew it on restarts all night long. Inside or outside, it did not matter. I could not get going. A third-place finish tonight is not something to hang our heads down on. We've been working really hard, so I'm excited to come out of here with a solid top-five finish." Self took over the lead in the K&N Pro Series West standings. He has a one-point advantage over Derek Thorn, who was fourth at Lebanon. Hayley dropped into third place in the K&N Pro Series West standings, eight points behind Self. Pursley is in fourth place in the K&N Pro Series West standings, nine points out of first. 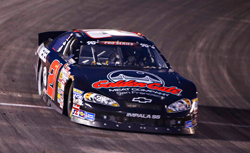 The next race in the K&N Pro Series West is the Carneros 200 at Sonoma Raceway in California on June 22. Find out which K&N performance products are available for your vehicle using the K&N Application Search at KNFilters.com.